Skiers compete in the action-packed relays at Junior Nationals on Saturday. After a week in the spotlight, the Auburn Ski Club Training Center has a week to recover before hosting another national event. 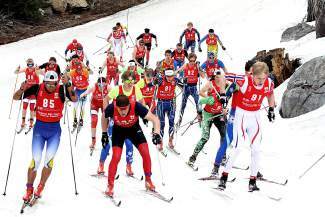 The USSA Cross Country Skiing Junior National Championships wrapped up with the Classic races on Friday and the action-packed Relays on Saturday, which marked the fourth race at the Donner Summit resort in six days. Auburn Ski Club is now set to host the 2015 U.S. Winter Biathlon National Championships this Friday through Sunday. Clark said that hosting Junior Nationals during such a low snow year required a monumental effort by the Auburn Ski Club staff members, who were aided by a small army of local volunteers. They began in late January by stripping snow from other trails and piling it onto the main loop course used for the event. While the visitors were treated to balmy conditions for the opening Sprint races last Monday, they got soaked by a rain/snow mix for Wednesday’s Freestyle races. Although the sky was a bit overcast for the final days of competition, warm temperatures returned for the Classic races and Relays. A number of athletes on the local Far West Nordic team posted impressive results in both events. JC Schoonmaker, a freshman at North Tahoe High School, led the Far West contingent with a third-place finish out of 62 male U16 racers. He finished behind winner Nolan Herzog of the Rocky Mountain division and Canyon Tobin of Alaska. Far West’s Haydn Halvorsen finished 14th and was followed by teammates Dawson Smith (43rd), Cooper Anderson (47th), Nate Cutler (51st), Chris Miller (53rd), David Dalicandro (54th) and Ian Smith (55th). Hannah Halvorsen of the Sugar Bowl Academy was the top Far West skier in the female U18 race, placing eighth. Savannah Blide was 55th and was trailed by Far West teammates Lizzie Larkins (57th), Jenna Rohlf (65th), Tara Gallant (66th) and Amanda Kirkeby (67th). New England skiers swept the top two, with Katherine Ogden winning and Julia Kern finishing runner-up. Hailey Swirbul of Rocky Mountain rounded out the podium. Quinn Lehmkuhl of Far West recorded a top-10 finish in the female U16 race, in ninth place, while Ursula Volz was 29th. Other Far West skiers included Grace Bronstone (42nd), Sofia Sanchez (50th), Carrie Bradley (51st), Bri Parker (54th), Camille Syben (58th), Meaghan Thompson (60th), Chloe Gorman (65th) and Abigail Baier (67th). Brooke Dunnagan of Intermountain claimed the victory, Anna Johnson of Midwest was second and Sydney Palmer-Leger of Intermountain was third. Bria Riggs, who finished 20th, was the only Far West female U20 racer. Emily Hyde of the Pacific Northwest won, while Vivian Hett of Midwest finished runner-up and Hannah Hardenbergh was third. Shane Christian (32nd), Peter Holmes (46th) and Aaron Deeter (52nd) represented Far West Nordic in the male U20 race, which was won by Thomas Oharra of Alaska. Midwest’s Ian Torchia placed second and Sam Wood of Intermountain third. Twelve Far West athletes took part in the male U18 race, including Peter Carroll (32nd), Dylan Syben (42nd), Julien Bordes (54th), Casey Jobe (55th), Trace Calvin (61st), Ryland Belisle (63rd), Skyler Mullings (66th), Connor Kusumoto (74th), Sam Zabell (76th), Cam Goldstone (78th), Brandon Herhusky (85th) and Calvin Forsythe (86th). Eirik Soergaard Anderssen won, while Intermountain’s Logan Kiekmann and Max Polito finished second and third, respectively. Saturday’s Relays were arguably the most exciting event to watch, featuring teams of three and a packed race course lined by cheering spectators. Far West’s female U18 power trio of Hannah Halvorsen, Lehmkuhl and Larkins led the local squad with a sixth-place finish. New England, with Ogden, Kern and Leah Brams, claimed the win, while Rocky Mountain finished second and Midwest third. In the female U20 event, Blide, Kirkeby and Briggs teamed up for a ninth-place finish for Far West, while the local male U18 trio of Holmes, Deeter and Christian matched the ninth-place results. Midwest (Hett, Anna French, Caroline Brisbois) was the top female U20 team and was followed by Alaska and Intermountain. New England’s U20 male team (Austin Huneck, Benjamin Hegman, Ian Moore) won, while Intermountain was second and another New England squad third. Schoonmaker, Dawson Smith and Haydn Halvorsen placed 11th for Far West in the male U16 relay, and Cutler, Anderson and Dalicandro were 17th. Alaska (Luke Jager, Ti Donaldson, Tobin) captured the victory, New England was second and Rocky Mountain third. Four Far West teams raced in the male U18 division. Carroll, Bordes and Dylan Syben led the way in 11th, Jobe, Belisle and Calvin were 18th, Zabell, Mullings and Herhusky 20th, and Kusumoto, Forsythe and Goldstone 27th. The Midwest team of Mackinley Fitzpatrick, Leo Hipp and Zak Ketterson raced to a first-place finish and were followed by two New England squads rounding out the podium. Another four teams represented Far West in the female U16 race. Camille Syben, Bradley and Parker led the way in 15th, while Volz, Sanchez and Bronstone were 16th, Hamilton, Gorman and Claire Lang-Ree were 17th, and Thompson and Baier 20th. The Intermountain trio of Palmer-Leger, Anna Gibson and Dunnagan won and were trailed in the top three by Midwest and New England. Far West Nordic placed sixth overall out of 10 divisions, with 339 points. New England won the overall with 1,190 points. They were followed by Midwest (1,023), Intermountain (980), Rocky Mountain (966) and Alaska (906). After Far West were Pacific Northwest (338), Mid Atlantic (205), Great Lakes (102) and High Plains (55). Find complete results from Junior Nationals here and photo galleries from every race here.